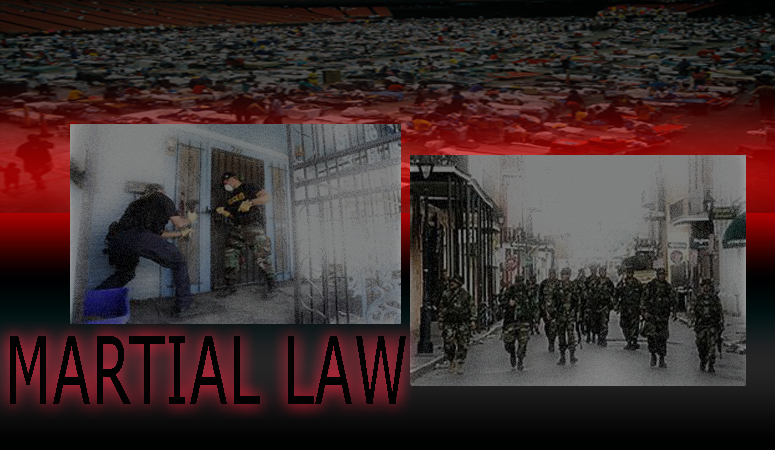 The establishment has been working hard over that past few years to make martial law the norm in the United States. A few events which are most responsible for the normalization of martial law stand out in most of our minds. First there was the frightening gun confiscation and private home intrusion seen in the aftermath of Hurricane Katrina in 2005. Particularly after the flooding in New Orleans. Many people witnessed for the first time the real horrors of martial law as militarized police, the National Guard and FEMA all operating until Federal orders bullied ordinary civilians around forcing them out of their homes and into a FEMA camp set up at public arenas. At the time, no one was used to seeing this here in America. But after a while people carried on with their business, but the memory of the arguably acceptable martial law scene playing out in the case of a natural disaster stayed in everyone's memory. Then 8 years later on April 15, 2013 we had the staged Boston bombing pressure cooker detonations at the Boston Marathon. We all know the story, how within the following days the establishment cooked up the “chase” for the real perpetrators which they used to officially introduce the “lockdown” concept. I warned about this then. To this day I firmly believe the Boston bombing was set up to show America how an “event” can and will be used to lock down a town or a city. As with Katrina, in the Watertown MA lockdown we saw illegal and forceful home invasions as militarized police forced their way into people's homes and forced people out of their own homes in the name of looking for “terrorists” who supposedly were responsible for the “attacks”. No one questioned the lying crisis actors running around with fake bright red blood stains on the ground and Hollywood style torn clothings. No one questioned the actor rolling around in a wheelchair pretending his leg was just blown off while looking robust, oriented, wide awake and with a full colored face. For that matter, no one questioned all the Craft International mercenaries clearly scene on camera communicating, preparing and monitoring the scene of the “controlled explosion”. Instead all the focus soon went to the chase, the lockdown and the eventual murder of one of the accused men. Fast forward to November 13, 2015 where we saw a series of bizarre supposed shootings that were all attributed to CIA's ISIS. Strikingly, the event lacked the expected unedited evidence you would expect from a mass shooting in a large city, living in a technological world where almost everyone carries a video camera on their cell phone. Without getting into the details of the Paris attacks of, the one important thing that everyone must pay attention to is that the event was used to again “lockdown” all of Paris and even other parts of Europe. After the Paris attacks there was even talk in New York City and other cities in the US about heightened alert and such. The point I made at the time of the Paris attacks was that the “event” was used to trigger police activity in other parts of the world. The “lockdown” concept had just grown to the next level. As “lockdown” is rolled to the general public as the new norm, is anyone asking, what is lockdown? Or, why it is necessary? 1- “Lockdown” is based on the delusion that we are all living in one big stadium or locker room that needs to be purged one locker at a time for there to be true justice or for the government to keep you “safe”. Of course thinking that it's the government's job to keep you safe is another delusion in itself. 2- The “lockdown” psyop delusion makes everyone think that if police can barge into anyone's home at will, then they will have the tools they need to catch the bad guys. 3- The “lockdown” psyop delusion is based on the assumption that police are chasing the correct suspect. The idea that vigilante killings (Chris Dorner), patsies (Boston bombing), or that staged shooting (San Bernardino, Umpqua, Virginia TV Reporter etc) are now the norm, is not even part of the equation. Thus the lockdowns are based strictly on government and mass media controlled unchecked “evidence”, in other words propaganda. 4- The “lockdown” psyop delusion is based on the idea that a lockdown actually works when in fact there are no historical examples where a lockdown was the direct tool that allowed police to catch a criminal. Criminals have been caught since the beginning of time without the concept of lockdown. In fact, in today's world of high technology and government surveillance it is now easier than ever to get caught by police. More than ever, it is getting very difficult for criminals to hide from the control system. Therefore more than at any point in history the concept of lockdown is NOT needed. It only serves as a tool to anger law abiding citizens, trash the Constitution, and empower a tyrannical government. After 9/11 the word “terrorist” was the buzzword to get everyone worried in fear and bowing to federal government tyranny. For years, all you had to say was “terrorist” or “terrorism” and most Americans would give way to the Federal government tyrannical forces. But now that the “terrorist” buzzword has lost a lot of its power due to overuse, the control system has had a lot of time to improve their Neuro-linguistic mind control on the general public and they've added quite a few terms to their mass mind programming. “An active shooter and three gunshots were reported at the U.S. Naval Medical Center in San Diego on Tuesday, triggering a law enforcement response although there were no reports of deaths or injuries. The U.S. Navy said in a statement, based on initial reports from a witness, that three shots were heard in the basement of a building housing a gym and barracks at the medical center around 8 a.m. PST (1600 GMT). First responders and Navy working dog units were on scene clearing the building where the shots were heard, the statement said, adding that the medical center was on lockdown and a shelter-in-place order had been given. A post on the medical center's Facebook page advised occupants to "run, hide or fight," the protocol advised by the U.S. Department of Homeland Security in response to an active shooter. The critical thing I would like for everyone to observe about this recent story is that gunshots were “heard”. No one knows anything else (as of the time of this story). Also note that no one died. But despite this minimal amount activity reported notice how the situation automatically demands that the entire medical center is on lockdown. Also notice how the Department of Homeland Security is already involved. Isn't it strange how the DHS ALWAYS seems to be in the neighborhood snooping around almost always having “drills” prior to or during these “shooting” events? I think it is highly suspicious that DHS is even mentioned in this story tied to “lockdown” and “active shooter”. This is another reminder that the new world order is trying to force itself on all of us and now the general public is expected to immediately stand down and allow the federal government and militarized police to do whatever they please as soon as these Neuro-linguistic conditioning psyop terms are put out by the mainstream media. This latest story is a textbook example of this programming. No one should be fooled by these psychological tactics and clever word games. It's all part of the delusion being imposed on the masses. The bottom line is that “lockdown” is just another buzz word for martial law and lockdowns don't work except for those trying to impose tyranny. The lesson to learn here is that there are no words that any American should accept as an acceptable buzzword to allow the justification of martial law. We must be aware of how we are being manipulated otherwise we'll never solve the problems we face now. Let's do everything we can to expose the process by which the control system slowly establishes their control over the masses. Understanding how they use key words is a central part of this strategy. If you understand this and agree please share this message with others.